The RCT-Rx102 operates as a normal DSM2 receiver but includes some additional features making it well suited to controlling battery powered locomotives and for operating live steam locomotives (see examples of installations in live steam locos). It is small and lightweight with outputs from seven channels. It can be powered with a supply from 3.2v to 10v DC (though 5v is recommended). The six servo outputs (Channels 1-6) can be used with an Electronic Speed Controller (ESC) such as the Brian Jones Mac5 or the MTroniks Viper Loco 10, or can be linked to servos to operate the regulator, whistle, blower, gas valve and reverser on a live steam loco. If used with the RCT-Tx22 or RCT-Tx24, or the Deltang Tx22 or Tx24, the output from Channel 1 is used for speed control. 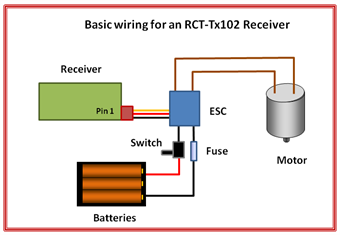 The wiring for using an RCT-Rx102 with a third party ESC is very straightforward. If using rechargable batteries, you may want to include a charge socket. If the receiver loses the signal from the transmitter, for example when going through a tunnel, then the outputs hold their settings until the signal is restored. This means that the loco will continue doing what it was instructed to do before the signal was lost. You could switch off the transmitter if, for example, you are running the loco round a continuous circuit and it will continue running. Switch on the receiver. The LED will flash rapidly. Move the Selecta switch on the RCT-Tx22 (or Tx24) transmitter to the required position. Hold down the bind button on the transmitter and turn it on. Release the bind button on the transmitter. The LEDs on both the transmitter and the receiver should flash more slowly for several seconds. Binding is complete when the LEDs stop flashing and stay on. If the LED does not come on within ten seconds or if it flashes every two seconds, then the binding process has failed (this happens very occasionally). Switch off both the transmitter and receiver, move them closer or further apart and retry. Binding is most reliable when no other 2.4gHz transmitters are on nearby. Although mainly intended for use with Tx22 or Tx24, Selecta can be used with a standard DSM2 joystick transmitter using the Channel 2 trim control to select different Selecta enabled receivers. Each loco becomes 'active' when the trim is within a seven click range (3 clicks left and right) of the position memorised during binding. Signal Pin 6 can power a forward facing LED and signal Pin 7 a backward facing LED on a loco. By default they respond to Channel 1 (the throttle control) or or can be reporgrammed to respond to Channel 3 (Direction switch) if you want the receiver be programmed for 'low off' control. Pins 6 and 7 provide 3.1v when on and 0v when off. The receiver has built-in 180ohm resistors to limit the current through LEDs to around 12mA and so there is no need for additional resistors when connecting LEDs. The anode (+ve) lead on the LED is connected to the signal pin and the cathode of the LED is connected to 0v (the negative lead from the battery). The anode on an LED is usually slightly longer or sometimes there might be a dot or a flattened edge beside the cathode on the case of the LED. The servo output settings for pins 1-3 can be adjusted if, for example, you need to change the direction the servo operates or reduce the length of the servo arm travels (ie the 'throw'). This is useful when using the receiver with live steam locos. The aerial must not be shortened or lengthened - it is a precise length to coincide with the wavelength of the signal from the transmitter. The range of the aerial will be affected if it is surrounded by metal. Ideally the aerial should be placed outside the body of the loco and preferably not touching anything metalic. Where this proves difficult to achieve, it is possible to have an extended aerial fitted to the receiver for a small charge. Here are some examples of places in which the receiver has been fitted in live steam locos. After installing the receiver, it is important to perform a range test to check that you still have control of your loco to and from all positions on your layout. Range will be adversely affected by the level of charge in the batteries (Rx and Tx) and also buildings (eg sheds), foliage, structures and people which intervene between the transmitter and receiver. Generally, though, you will be following your loco around and so range will probably not be an issue in most gardens. Remember, with cruise control you loco will continue to run at the same speed if the signal is lost. Only one pin output can be changed at a time. To change Pin 1 (Channel 1 - throttle) put the small (red) bind plug on Signal pins 4 and 5. To change Pin 2 (Channel 4) put the small (red) bind plug on Signal pins 5 and 6. To change Pin 3 (Channel 3 - direction) put the small (red) bind plug on Signal pins 6 and 7. Turn on the receiver. The LED will flash every half second. Turn on the transmitter (and Selecta position) to which the receiver is bound. The LED will flash once every 2 seconds until it locks on to the transmitter signal and then stay off. Low and High side throws can be changed by up to 16 steps each way. The middle Neutral position can be changed by up to 32 steps each way. The LED will flash and throws will change one step per second while a plug is installed. The LED stays on for 3 seconds when throws are returned to their 'mid' position. The LED stays on steady when you reach the end of the adjustment range. To increase high side throws, use the large (black) bind plug to connect the signal pin of Pin 7 to negative. To decrease high side throws, use the small (red) bind plug to connect the signal pin of Pin 7 to positive. To move the centre position 'up', use the large (black) bind plug to connect the signal pin of Pin 6 to negative. To move the centre position 'down', use the small (red) bind plug to connect the signal pin of Pin 6 to positive. To increase low side throws, use the large (black) bind plug to connect the signal pin of Pin 5 to negative. To decrease low side throws, use the small (red) bind plug to connect the signal pin of Pin 5 to positive. To reverse the direction the servo moves, use the large (black) bind plug to connect the signal pin of Pin 4 to negative. To return the servo travel to the normal direction, use the small (red) bind plug to connect the signal pin of Pin 4 to positive. Remove all plugs and turn off the receiver and back on again to use all outputs normally.